One of the leading scholar on leadership and decision making is Max Bazerman who has produced another good book on practical decision-making, The Power of Noticing. His simple observation is that to become better decision-makers we need to increase our power of noticing. Too often we do not see the details in front of us, or what may not be in front of us because we are over-focsued. 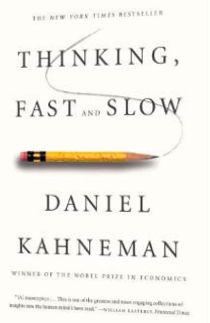 Daniel Kahneman's work on fast and slow thinking develops the concept of WYSIATI, "What You See Is All There Is". Our focus only on what is immediately available is a critical bias in our thinking. Bazerman describes an opposite problem, WYSINATI, "What You See Is Not All There Is". You have to focus on noticing what is not there or what you may be missing. Our bounded awareness creates a more decision-making environment. For Kahneman, the answer is thinking slow. Bazerman takes as slightly different view. The answer is improving our power of noticing. 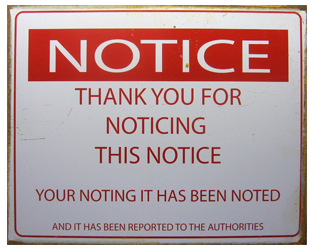 All investors have to realize there are impediments to noticing. Some of those are institutional. We create environments where noticing or looking outside of the box is frowned upon. Call it institutional blindness. There is motivational blindness and conflicts of interest with looking. Leadership is more than just doing a better job of observing but forming a culture of noticing. There should be no predictable surprises. Forgetting hindsight bias, noticing should eliminate phrases like, "why am I always surprised by that" or "I should have seen that coming." Form our perspective, the best investment solution for noticing is constant research, measurement, and rules. Having a system of what is known frees time for looking at new research and creates a culture of analysis. An irony with any rules-based system is that its success is through constantly looking for ways to improve the system. Slow thinking and noticing to always determine whether the rules as odds on favorite. In the 80's and 90's understanding the Fed was all about reading the tea leaves of unknown behavior. The focus of analysts, Fed watchers, was on the lack of Fed transparency. Firms hired former Fed economists to get the inside scoop on what was going on in the FOMC. You did not see minutes and you did not get clear answers on policy. It was all about reading the tea leaves. 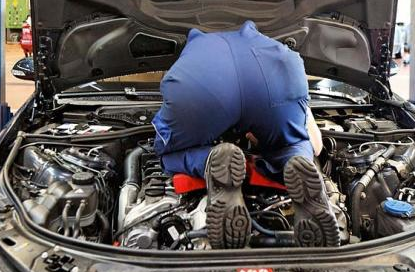 2015 will be a very different year because the mechanics of monetary policy will be more important than ever before. It will be important to know not only what the Fed will do but how policy will do implemented. The microeconomics of policy will be very relevant for banks, dealers, and money funds The rate on excess reserves, the reverse repo rates, the structure of the balance sheet, the lending behavior of the Fed, bank regulations, Fed forecasts, and transparency from policy statements will all play a part. Looking at just the Fed funds will not be enough. Similarly, the Fed cannot just raise the Fed funds rate and assume that the balance sheet will adjusted through separate set of objectives. Investors will have to spend more time learning the arcane dynamics of money. Policy transparency and forward guidance is still a major area of uncertainty for investors. Clarity is still in short supply, but the added dimension of Fed mechanics uncertainty will test the skills of any rate sensitive investor. The big story for hedge funds has been the return of managed futures, not that it ever left the investment strategy choice set, but 2014 has proved managed futures to be an effective strategy relative to many other hedge fund styles. 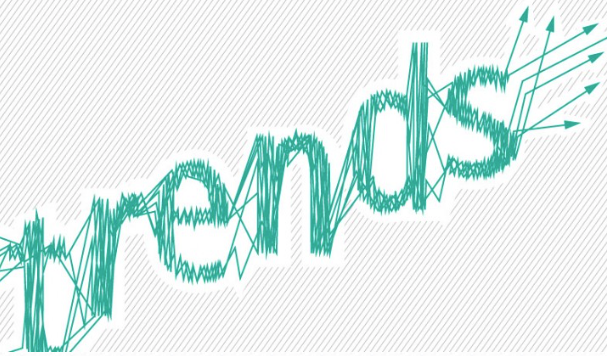 Managed futures is still mainly a strategy of trend-following. Hence, its success will be tied to big trends. To break down the story of its success this year, you have to focus on the major market trends. Nevertheless, individual market trends at usually not enough to drive performance. You need to have asset sectors make big moves and this what made 2014 special. On a more micro level, big fund returns are made when the most liquid markets have a move. It not enough to have a big move in a single illiquid market. Diversification will dampen the effect of a one market trend. Here were the big moves for the year. The return of currency trading. With a significant number of G10 currencies declining more than 10% over the year, it was a great year for currency trading. Given the relatively low volatility for the asset class, it does not take as great a move in price to create profitable trends. The long dollar basket was able to generate consistent performance with volatility still being in the low end of the multi-year range. The drivers of expected tightening by the Fed and loose monetary policy in Japan and QE in Europe created a perfect trend environment. The big oil move made the energy sector another winning sector. The oil market declined from year highs of over a $100 per barrel to current levels of $55 which is close to a 45% decline in price in about six months. These intense trends just do not come very often. At current volatility this was more than a two standard deviation event. Heating oil and RBOB gasoline saw similar declines in price over the same time. The exception was with natural gas which declined in the first half of the year before rebounding. In this case the oil complex was a good short trade across the product board. Equity indices continue to provide trend opportunities. The market trends for equity indices were generally upward for the last year, but there was a significant difference based on the geographic region. The S&P 500 was up 13.4%, but the European STOXX 50 gained only 4.58%. The Nikkei gained 10% for the year. However, the trend was interrupted by significant reversals such seen in October markets. Bonds also showed trends even at low overall levels. The bond rallies for most of the year were the surprise event for many forecasters. However, changing yield curve dynamics meant that picking the right maturity was an important part of a generating sector profits. The gain in the long bond (US) was almost three times as large as the 10-year (TY) futures. Short-rates were not an area of for profitable trend except if trade were made out the curve beyond 18 months. Commodity markets required more skill to generate gains even with a number of markets showing strong ranges within the year. The success in commodity trading was more dependent on trading less liquid markets like softs, cattle, and hogs. For example, coffee moved higher by over 50% and cotton saw a decline of over 50% from its intra-year high. Cattle and hogs both saw retreats from large earlier in the year trends. The strong trends in the grain markets saw significant intra-year reversals. For example, corn rallied close to 20% until May only to drop 40% until October and then see a 20% rally. These reversals will cut into any trend strategy. Soybeans and wheat followed a similar pattern. The ability to take profits and reverse positions was the key to commodity success. The metals markets generally trended downward but the behavior was not as straightforward as obviously seen in the energy markets. Again, the success with trading metals was based on the market choice. General sector exposure would not be enough for highly profitable trend trading. So which markets will be the trend drivers for 2015? The true trend-follower will be very straight-forward with an answer. You just don't know. Trend-following is non-predictive in the sense that it does not make forecast but follows what the market prices provides. There is only one prediction; trends will happen at some time and in some markets. Calculated Risk suggested that there are ten big questions to be answered for 2015. I agree with the list, but I also think there are some additional key questions that have to be addressed. Any investor should think about what should be their answers to these questions; however, forecast at your own peril. The one think we have learned through our systematic trading is that macroeconomic forecasting can be a fool's game. The key is to stick with what the market is telling you and just determine the current state of the world and not try to move to forecasts that are subject to error. Here is the list of key variables that have to be forecast and some of the major impediments that will face sustainability. Economic growth - The third quarter growth caught everyone by surprise, but also was within earlier expectations that the second half of the year would be a lift-off period. The question is whether US economic growth will be at the old normal or the new normal in 2015. Can the output gap closed? Unfortunately, the gap between growth and market move is often not strong. Employment - You have to go back to the 1990's to have an employment year like 2014. 200,000 jobs a month has cut into the backlog of unemployed but the issue is whether there is enough growth to sustain the 200,000 months. Unemployment - The unemployment rate has fallen faster than what many have forecasted. In fact, it has fallen so fast to 5.8% that the Fed is now focused on slack in inflation as a guide for policy. It is hard to believe that 2015 will continue to see this number decline. Inflation - US inflation is below the 2% target and heading south on falling oil prices. The question is when will we see the magic 2%. The only way this is possible is for oil prices to increase and growth continues at the rate seen in the third quarter. Monetary policy - The first increase is expected in mid-2015, but there is enough uncertainty that a delay should not catch the market by complete surprise. Oil prices - OPEC thinks oil prices will stabilize at the higher price of $80, but the marginal producers are non-OPEC members. The only way for prices to rise is for producers to find current prices worthy of a shutdown in production. This will only occur if there there is further strain in the energy sector with increasing credit problems. Residential investment - The investment rate for 2014 was below 2% and not like the double digits of the last two years. For new residential investment, the market will have to see prices moving up at the rate seen over the 2011-2013. Housing prices - The rate of increase in the Case-Shiller index was about 5% for 2014. Not bad for this market, but less than the stock market. If rates are moving higher, it harder to thing the housing prices will return to double digit numbers. Housing inventory - The inventory numbers are starting to move higher. The dynamics of housing is such that we do not know the real supply that will be available at any price. Many homes have been held back from the market, so it hard to forecast inventory changes. Wage increases - We have economic growth. We have rising employment. We have tightening in labor, but we do not have increases in real wages. It is hard to see how growth can be sustained if real wages are stagnant. Europe growth - No fiscal policy and and unclear monetary policy makes it hard to determine whether we will see any robust growth in this region. Japan growth - Abenomics has gotten the stock market higher and the year has fallen nicely but this all to get growth higher. Chinese growth - The 800 pound economic gorilla will drive commodity markets and capital flows, but how will this work if growth is below 7%. We may have opinions on these markets but we think that few of the consensus forecast will prove to be true in 12 months. This is the normal situation regardless of how many times we play the end of year prediction game. You have to make an investment decision and the clock is ticking. The decision has to be made now or at least you believe a decision is necessary. You may have a lot of information in front of you, but there will always be uncertainty concerning the result of any decision you may make. There is always uncertainty with the information available to make a decision. You just don't know whether you had all or the correct set of information. A key question to ask with any decision is, "What do I wish I knew?" and "If I know more information, would I better for it?" More is not necessarily better, but knowing what is needed is critical. Investors want to have the best odds in their favor. You often wish you had more information, but you are not sure what. However, if you were given more information, you are not sure that it would be useful. The extra effort of finding any more information and delaying a decision also may not worth it. There costs with searching for more information.. Other are also playing the same game, so you also have to assess what information others have and whether you are at an information disadvantage. 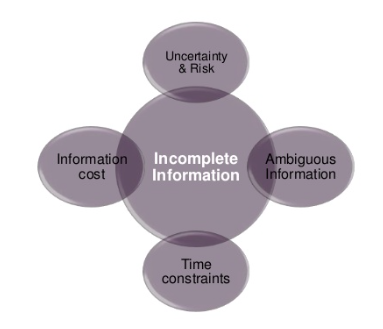 Too often we are dealing with problems of incomplete information. There are time constraints with our decision-making. Delay is costly. There are information costs. New information may not be cheap. There is ambiguous information. Some information could be wrong, have some error, or subject to revision. The lack of information completeness could simply be that it is not being handy. The key role of systematic trading is making all of the information you dream about handy and weighed in an appropriate manner. Systematic trading allows for preparation time for any decision. The manager can gather all information he feels is necessary so there is not regret on what could be used for a decision. Its value of preparation is that decisions can be set-up for any set of scenarios. Any past information can also be tested to determine its impact on some make behavior. The cost of information analysis and gathering can be minimized because it is reviewed and structured in a formal process. Is the information reinforcing or unique to the problem at hand? Does it confirm or is highly correlated with information already available? These are all important questions on the whether new information is relevant, but it cannot be answer without some testing. A Rules-based approach allows for decisions that are based on past facts. Any information not used is based on preference, theory, and testing. Of course, that does not mean that a systematic approach will have all of the answers. There can still be surprise from a new event that has never been anticipated or does not have history. Model risk and error still exist but it can be measured and quantified. The choice is simple. Do not test and prepare decisions scenarios, and suffer information regret. Do your testing, form your rules, and play the odds of success without information regret. There are many definitions of cash, and investors perceive there are different forms of cash that are relatively the same or that are interchangeable. I think not. Cash's critical characteristics are that it serves as a store of value and has instant liquidity, the ability to be immediately available as a medium of exchange. The change in money market regulation and the stretch for yields has muddled the definition of cash or money; consequently, investors are going to be in for a surprise if there is a economic or market slowdown. Cash will not be cash. The definitions will be stretched and broken. From an institutional perspective, cash is not legal tender but any short term instrument that can be exchanged in the market immediately at a par value. There have been long debates on what is money and those are going to have to be resurrected with money funds having to have a floating NAV. Cash is not a good store of value because inflation is eroded value. Real rates are negative, so investors push the boundaries for what is money. Riskier investments are used as money to maintain the store of value. 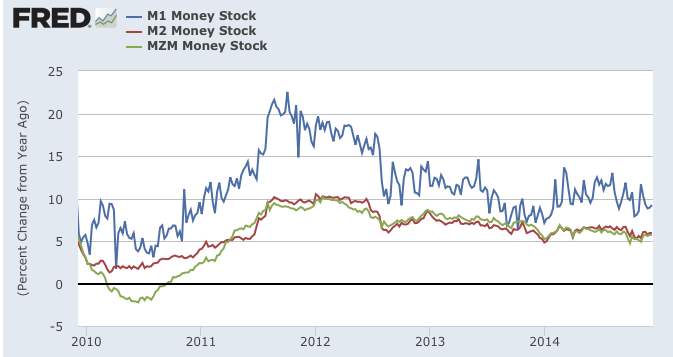 The issue is further exacerbated because of the new money market rules. A floating NAV may be a good thing, but it also means that money funds will no longer meet the definition of money. Similarly, the use of gates or redemption restrictions on money funds means that investors will not have immediacy. 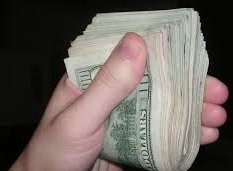 Money funds in this new world, again, cannot be viewed as money. The gap between old forms of money will increase and become more volatile. Under this environment there will be a shortage of safe assets or money if there is another financial crisis. This may create a number of unintended consequences.Short-term investing in financial products will be disrupted and the interest rate differentials in near-money will widen. It is not clear that this is the result policy-makers want during the next financial upheaval. 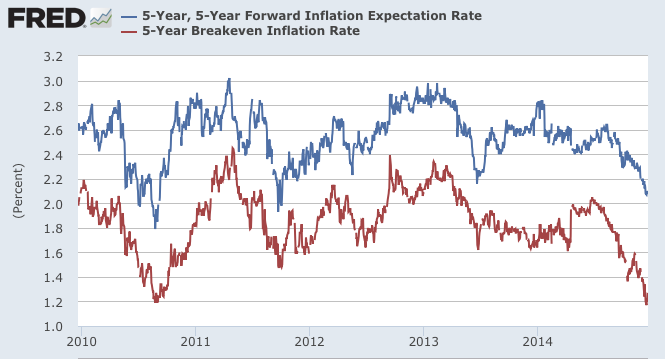 Two closely watched measure of inflation expectations have fallen significantly in 2014. This is the current main worry for the Fed. The 5-year break-even has declined by approximately 40% from a 2% level to now 1.2%. The longer term break-even inflation rates, 5-year , 5-year forward rate has also fallen but it is still slightly above 2%. The worry for both these trends is that even with inflation falling from the oil price decline shock, nominal interest rates have also declined. Fixed income markets have been moving in lock-step with the inflation declines. While many have talked about the steady policy behavior of the Fed over the last year, it seems that the Fed has switched from concern about unemployment to now inflationary expectations as the key driver for policy. 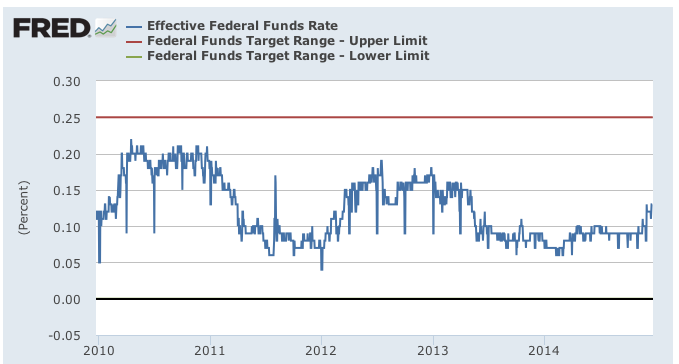 With break-evens closer to 1% than the 2% target, it is hard to see the Fed speeding up any policy decisions. The effective Fed funds rate has been inching up since November like many other short rates, but it is still in the middle of the Fed target range and lower than a year ago. The IOER (interest on excess reserves) rate that has been set for required and excess reserves by the Fed is at 25 bps, so there is little reason for bank lending in reserves outside the Fed. The main players (lenders) in Fed funds will be those not eligible for IOER, Federal Home Loan Banks (FHLB) and other GSEs. The majority of these Fed funds traders are the FHLBs at about 75% of trading volume. Trading volume in Fed funds has fallen from about $200 billion per day pre-crisis to current trading of only $60 billion per day. FHLBs will lend at less than the IOR rather than hold funds at the Fed for no return. However, even this limited Fed funds market competes against the Fed's reverse repo (RRP) program. 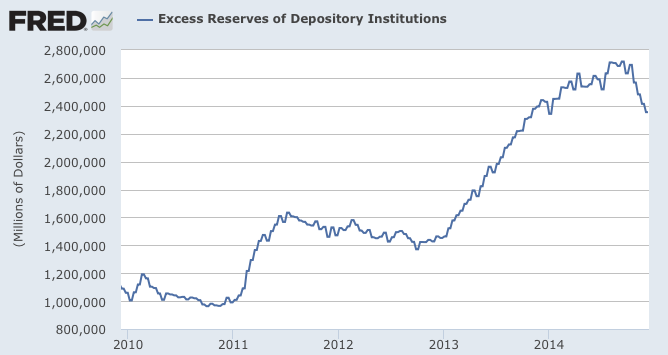 The excess reserves of depository institutions have declined significantly this fall. This decline will be the largest sustained fall in excess reserves over the last five years. While this is not enough to force Fed funds to the high-end of the range, it does tell us that there is change in the supply of excess reserves that will start to play-out in the first quarter of 2015. The more dynamic behavior of short rates in 2015 will be the big story of the new year. The start of any rate increase is still up in the air and not set for the middle of the year regardless of market expectations and forecasts. The dollar strength is a major trend because there is little stopping the current divergences in monetary policies across central bank. The dollar strength is clearly associated with a favorable growth differential versus Japan and the EU which drives policy action. The current dollar strength is consistent with the end of QE3 and the anticipation of a rate increase in 2015. Aside from technical factors, the key dollar trend risk is that the Fed does not follow through with its current direction toward tightening. A delay in the expected rise in rates will be dollar negative. Policy differentials drive currencies, but we also have to look at alternative stories. 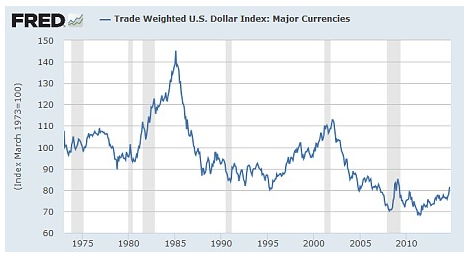 Dollar strength also has been associated with US and world recessions. A recession causes a flight to safety into the reserve currency, the dollar. If the current dollar trend continues, the dollar will push close to financial crisis highs when there was a flight to safety coupled with loose monetary policy. Hence, an alternative story for dollar strength is that it is signaling a flight to safety given slower growth expectations. We also know that dollar strength places pressure on emerging markets through dollar funding pressure. Dollar strength has also been coupled with lower oil prices; however, the lower dependence on oil imports makes this story less likely. Flight to safety and global weakness seem to be key forces to further push the current dollar trend. The question to be faced by the Fed is whether it should act on this weakness and safety flow and show further "patience" with any rate rise. Fed decisions on its relationship with the global economy may be more important than any policy action with respect to labor markets. The last twenty years has seen a significant ebb and flow in financial globalization. 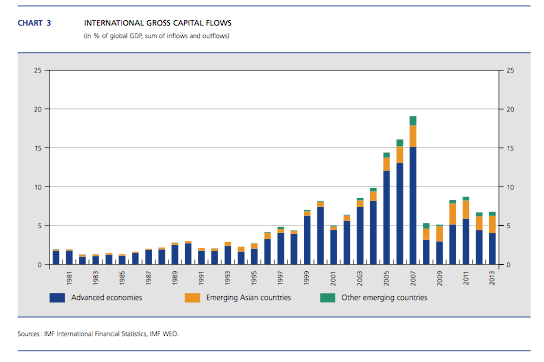 Global capital flows increased significantly up to the financial crisis only to decline with global recession. The deleveraging by banks and financial institutions has placed a damper on flows so that they have not returned to pre-crisis levels. There has been a backlash to financial globalization. 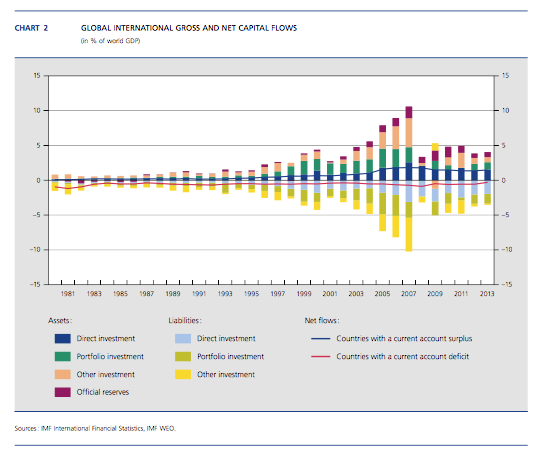 Chart 2 shows the drop-off in gross and net capital flows. These are much larger than 20 years ago but are flat for the post crisis period. Gross flows to emerging markets are at similar levels to the mid-200 period. Advanced economies are where the declines have been most dramatic. However, declines in financial globalization also is connected with polices and the currency wars now occurring across countries. It in not just private capital flows responding to a crisis and now being more conservative. 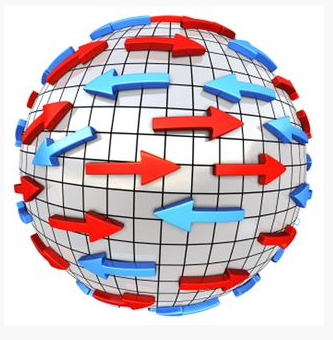 It is a changing market structure making it more difficult to invest abroad. We can describe at least five reasons for the deglobalization in financial markets. Some of the reasons are not going to change in the near-term because they are structural. The increase in capital requirements on banks means that there will be less money to invest around the world. Banks can be awash with excess reserves, but lending will be constrained given the new risk weighting from Basel III and the desire to stay liquid. The rules of the game are structured for banks to hold less risky and smaller loan portfolios. The reduction in global lending is also an artifact of the low and equal rates around the world. If there is no rate differentials, there will be smaller flows of money in and out of countries. Money will flow in response to return differences. The slower growth in emerging markets and around the world in general will mean less lending around the globe. The elasticity of lending to growth can be flexible but the direction is clear. Slower growth will cause slowing in global lending. Differences in sovereign ratings. There was a general increase in ratings around the world pre-financial crisis. That lifting in credit quality has reversed or at least stalled, so lending around the world has become a riskier affair. The push to capital controls as a means of controlling credit and growth has become more acceptable relative to pre-crisis thinking. If interest rates are zero, there have to be other means of controlling credit employed by police-makers. Capital controls are becoming more acceptable as a means of reducing capital movement. The world of finance is in for continued slow growth in capital flows. The backlash and headwinds are unlikely to change in 2015. 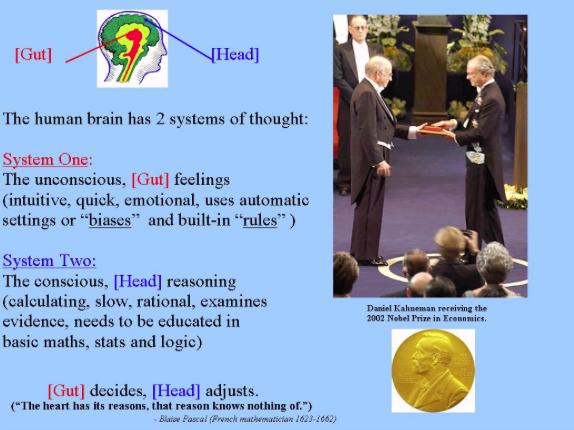 Nobel Prize winner Daniel Kahneman's core insight describing the faulty thinking of many decision-makers is found in odd acronym, WYSIATI. It stands for "What You See Is All There Is." Decision-makers want to jump to conclusions quickly, but there is a problem for many when they only see what is immediately available and not what may be lurking behind the scenes. WYSIATI thinking focuses on the obvious and not what could be most important. It is easier and faster to think this way. It is associated only with the "known knowns" and does to anticipate the "unknowns" or what is not immediately obvious. WYSIATI represents the problem when we use our system 1 or fast thinking and not our deductive reasoning skills or system 2 slow thinking. Kahneman often refers to WYSIATI in the context of information. When decisions rely on the information that immediately available as the complete set of information that is needed, investors are likely to make a faulty decision. When investors have to make quick decisions, they will likely believe that they have complete information. In those situations, investors will too often jump to conclusions. This would be the misuse of system 1 or fast type of thinking. If the information is difficult to find or obtain, again it is more likely investors will assume that what is currently available is the complete set of information that is necessary for making a decision. Decision-makers like to feel in control and one of the easiest ways to ensure that control is to believe that you have complete information or situational awareness. It is the analyst's version of "out of sight, out of mind". We will too often only focus on the information that is staring us in the face. If there is a news announcement, we will assume that it is the reason for the market rising or falling regardless of what past evidence may suggest. Thinking of alternatives may be too difficult because it requires recall and analysis. The WYSIATI intuition is a nice way of wrapping up many of the behavioral bias that have been catalogued in finance. This includes behavioral problems such as the anchoring, availability, or recency bias. Systematic or rules-based trading can solve this decision problem, yet can also be subject to this processing trap. The nice feature of systematic models is that all relevant information can be used to find and develop the best decisions. An investor is not limited to what is immediately available. Historical as well as obscure or information readily available can be employed to find the best model for predicting market direction. This processing can be done slowly and at our leisure to find the right data and information relationships. Of course, the benefits of deliberate systematic analysis can be mitigated if you do not use all of the data available. The modeler who only looks at limited price data will be subject to a WYSIATI problem. The model may not look outside of the immediate price information and consequently could be caught by surprise from a major announcement. Following the price action to the exclusion of all other information may not stop someone from hitting an impending brick wall. Using limited data will place greater emphasis on risk management as tool for limiting loses. If WYSIATI is a serious problem, it calls for more exhaustive research to ensure you have seen all perspectives. Conducting comprehensive and thorough analysis along with thinking outside of convention "wisdom" is the only solution to the ever-present WYSAITI problem. Thoughtful rules are a helpful first step. Big disconnect in rate expectations. Are we missing something? 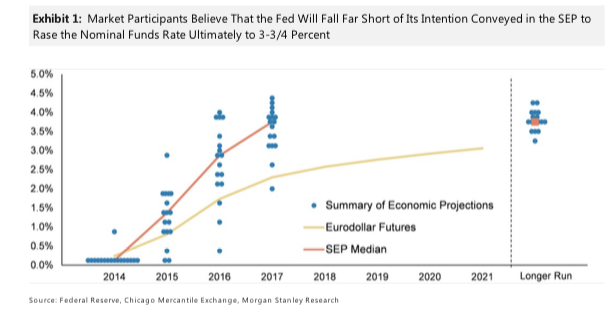 If you believe the SEP and you use the Fed funds futures as a forecast for when the first rate more will come, the rate increases are going to be come very frequently in the second half of the year. 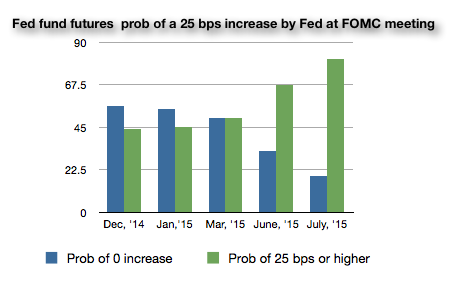 The chance of rate increase moves to over 50% for the June FOMC meeting. If you follow the SEP, there will have to be increases at each remaining FOMC meeting until the end of the year. There is going to be more focus on this issue because it is telling us that whatever Fed forward guidance being received by the market, the market thinks rate hikes are going to be happen slowly. Either the market has not received the right message or the Fed estimates of the expected rates are very different from what the Fed wants to tell the market. "What we have here is a failure to communicate!" Or, a failure to listen. This does to seem to be the intent of the Fed with providing good transparency. Most systematic trading systems have some form of stop-loss management. For example, a sell stop is set below the entry price of a buy order and represents the price that a trader will exit a long position. Many have looked at the setting of a stop-loss as a math problem based on the volatility of the markets and the expected loss on a position. These math frameworks are immensely useful, but it does not explain the wide range of stops used by traders. The stop loss levels are closely associated with the level of loss aversion of the system designer. You can senate the designer from the model. 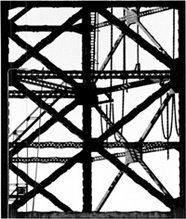 The fears and anxieties of the model builder will be represented in the stop-loss settings. This is one of the key features that distinguishes returns for CTA's. You our buying the manager's utility function as expressed through a well-formed set of rules. This is where behavior finance enters the world of disciplined system trading. There is no such thing as a model system that does not embody the value system of the designer. Loss aversion is one of the key features of behavioral finance. 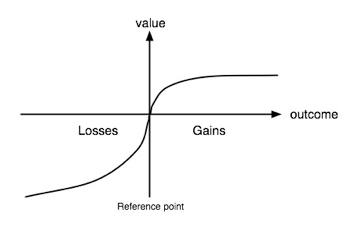 In fact, the whole idea of prospect theory as a subset of utility theory is based on the idea that investors are more sensitive to losses than gains. This aversion is one of the reasons for why traders will hold losers and have profit targets versus spending considerable time focused on loss management and letting profits rise. The pain of taking a loss is greater than the benefit from a gain. Since every modeler of a system has there own utility function, even if they want to cut losses and ride gains, each modeler will manage it in a different way. Hence, understanding the aversion to losses and risk are important in understanding how models are built. For example, are stop-losses adjusted after gains are made? Are there profit targets? Do stops reflect time? The model codifies the behavior of the modeler, so getting inside of the head of the modeler is relevant, no different than learning how a discretionary trader behaves. 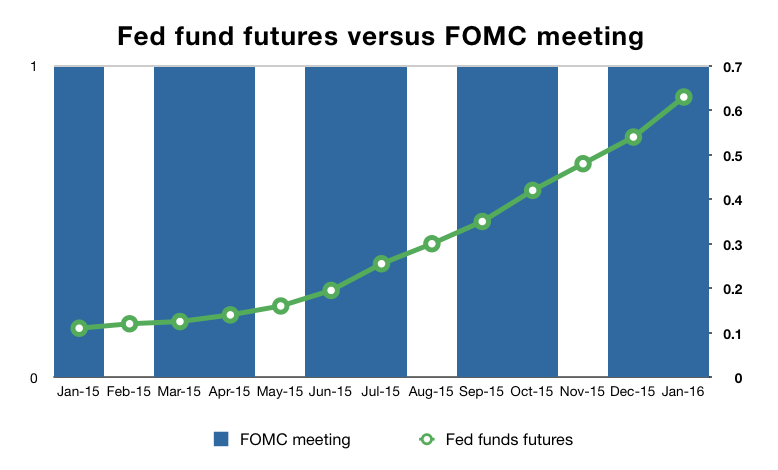 What are the Fed funds futures telling us about the FOMC? It has been awhile since the market focused on the Fed funds futures as tool for telling us what the Fed may do, but it is time to start watching this forecast market again. The Fed fund futures market is telling us that the first big rate increase is likely to happen in June. Of course, just looking at the curve and seeing at what month the Fed fund futures will be at or above 25 bps is a very simple way of looking at market expectations, but we can extract more information. The market information in the futures can tell us the probability of a change in rates by the central bank since we know the dates when the Fed will act and when the futures will expire. If you look at the FOMC meeting dates and see how they relate to the Fed funds contract that will expire around those meeting, you can estimate the chance of a Fed move. A simple measure of the change of at least a 25 bps increase at July FOMC meeting is 81 percent as measured on the CME Fed watch website. We may have some issues with the actual way that this is calculated, but it provides a good handicap of Fed changes. The website provides regular updated probabilities for each FOMC meeting using the Fed funds futures curve. The following graph shows the probability the FOMC raising interest rates at each of the next five committee meetings. For the December 2014 FOMC meeting which will occur this week, there is a less than 45 perfect chance that the Fed fund futures market thinks there will be a 25 increase. By March 2015, the probability is a coin flip for whether the Fed will raise rates. However, for the July meeting the futures market is guessing that there will only be a 19 percent chance of rates still being at the zero bound and an 81 percent chance that the Fed will have rates increased to at least 25 bps. 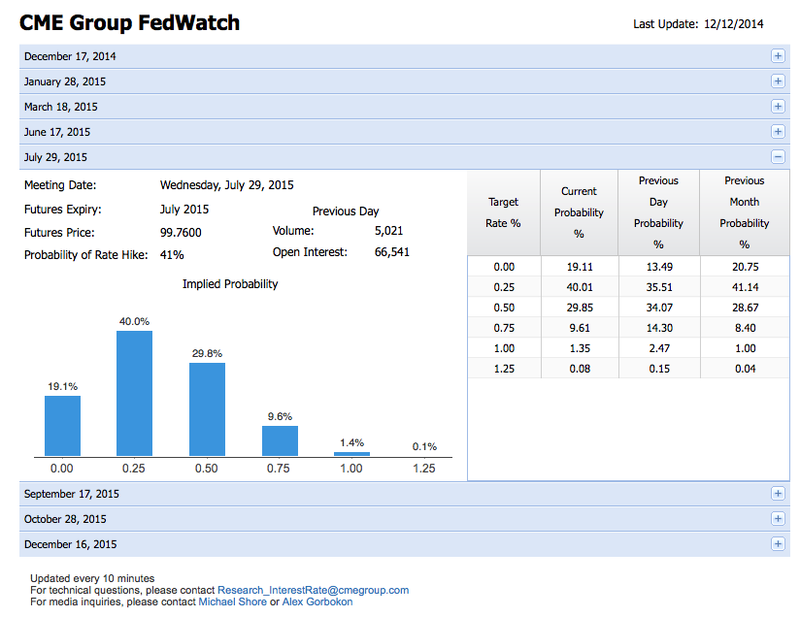 The probabilities flip in favor of an increase in rates for the June meeting. These market probabilities of some FOMC action are constantly changing and will be constantly priced in options and futures. This can be a good tool for handicapping rate changes in a manner that is significantly more measurable than a survey. The futures serve as a good guess of market sentiment through the actions of market participants and not just their opinions. The rates market will change significantly in 2015 which will be the key theme in for the new year. 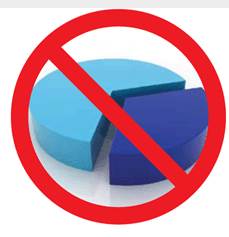 Is 50/30/20 the new 60/40 of asset allocation? The investment world has embraced the 60/40 stock/bond benchmark as a good rule of thumb for building a portfolio. There is nothing wrong with this benchmark and it has served many as an effective means of risk reduction and diversification. However, it may have to step aside with the revolution of alternative investing. There is not a strong theoretical foundation for the relevance of the exact 60/40 mix, yet it has served many well as a base reference for any asset allocation. The foundation has seen adjustments through the addition of international stocks and bonds as well as other asset classes. It has been restructured through risk parity, but it has still served as a standard. The historical number look good and it has done well in crises. Many has stated that keeping it simple works, but perhaps times are changing. There have been assaults on this base mix through the introduction of international stocks, real estate, and commodities, but none have capture the attention of investors like alternatives. Alternative investments have some of the key characteristics that appeal for those who want diversification. First, alternative have lower volatility than equities, so there is an immediate reduction in portfolio volatility from holding these assets. Second, and more importantly, alternative investments often have lower correlations to equities than many of the alternative asset classes. 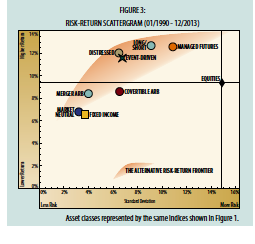 Third, the return profiles of alternative have more stable than for other asset classes. Consequently, there has been a growing movement to take some of the exposure in both equity and fixed income and place it in alternatives. Hence, the new standard mix of 50/30/20. There is no magic in this formula, but it seems to work for a growing number of investors when they start to make basic allocation decision. This is a high level or strategic allocation and easy to discuss. There is nothing about what the allocations within the alternative weight should be, yet it is starting to gain a hold with investors benchmarking. This impact of adding alternative to a classic stock/bond mix is clearly presented in a simple paper by the Quaker Funds. In the graph, you can see that alternatives provide unique return and risk opportunities. 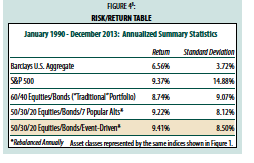 In the table, Quaker Funds shows the return and risk profile of 50/30/20 against the classic 60/40. The return to risk trade-off is compelling. In a low rate, low inflation, high stock price environment, there is a good reason why this new mix is starting to be a standard. Volatility has gone up - watch out! Yes, increases in volatility can hurt you, but changes in your risk tolerance will also cause you financial harm. Traditional finance assumes that your risk tolerance is fixed. Don't believe it. The behavioral biases discussions which have been the rage in finance is focused on how risk appetite or tolerance changes with your perception of the market environment. Your risk tolerance or risk appetite may be the most important determinant of how much you can or will lose from investing. Your acceptance of volatility or how much risk you are willing to take at a given time can change with your level of confidence, your processing of information, and other factors that have been described as behavioral bias. Since your appetites are hard to measure, we often discuss these issues in terms of biases. 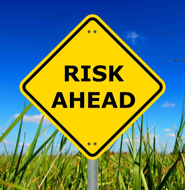 Your risk appetite is the total amount of risk per unit of return you are willing to accept and is generally thought of a relative concept for investors. Your risk tolerance is the total amount of lose an investor is willing to take. This could be viewed as the maximum amount of risk to be taken by an investor. There is a risk progression. You identify your risk appetite which can tell us something about our risk tolerance, but beyond a risk threshold, we will not be interested in even taking the bet. If your risk appetite is constant for a given return, you will cut back your exposure when there is an increase in volatility. A key problem with investors is that there risk tolerance is constantly changing or adapting based on a whole set of factors. This means that tolerance may increase or decrease at the wrong time. If you hang-on to losers, it is because you may become more tolerant to risk when you think you have to take the actual lose. If you sell your winners, your risk appetite is decreasing after you have some gains. There is a difference between risk acceptance and risk acknowledgement. When these diverge, you are in for some potential trouble. Your risk tolerance changes with age and experience. It is a function of whether you are part of a group or alone in your decision to invest. It will increase if you have a successful streak of trades or a series of losses. Of course, the story is a little more complex based on your expected return and risk, but you can easily see that if you are not careful, you may be adjusting your risk based on your current perceptions on not on long-term behavior. The benefit of a model or systematic trading is that it can ensure risk appetite and tolerances are measured and fixed. Knowing the risk you are facing is not enough for keeping you safe. You have make sure you do not change your appetite after the investment is initiated. Why do I have to follow the Chinese economy. There is no question it is big; however, more important is China's connection with the rest of the world. The map says it all in one picture. 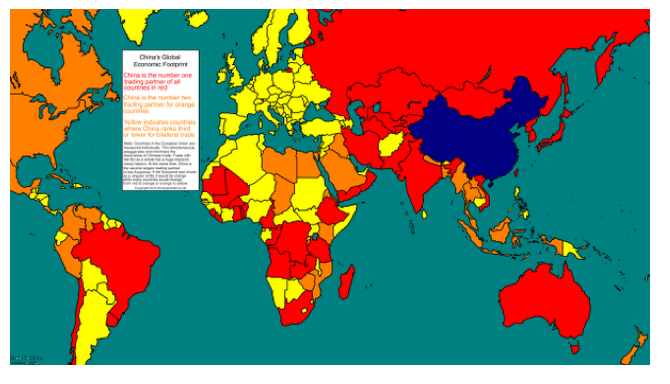 All of the red represents countries which has China as their number 1 trading partner and the orange represents countries which have China as their number 2 trading partner. The connections matter especially in emerging markets. As China goes, so goes the rest of the world. Similarly, if the the world slows, China will feel the economic pain. Fed moving from "considerable time" to "patience"
Language is everything in what we call the new forward guidance period in the post-QE world. There are reports that the Fed may move from language which says that rates will not increase for "a considerable time" to the Fed being "patient" before moving rates. This would mimic the language used in 2004. Still, it is not clear that this is an improvement in Fed communication. There has been a lot of talk of forward guidance but the concept has to be built on transparency and precision. The Fed has to say what it means and mean what it says. What this change may tell us is that the Fed would like a significant amount of latitude in its ability to change policy regardless of the economic numbers. Market analysts will have to spend time clarifying the language of patience which means that these words or phrasing has limited usefulness. If you have to ask someone to define words, then the language used is not precise enough. This is the very reason for using rules and specific guidelines. There is no ambiguity with a rule. Precision is true forward guidance. The managed futures strategy is closely aligned with systematic trading, a disciplined approach to making investment decisions. Daniel Kahneman, the Nobel prize winner in economics, provides a good framework for understanding why managed futures managers use systematic trading through his system 1 and system 2 decision framework. Managed futures are notable for their of systematic trading strategies. In fact more money is run through systematic strategies than discretionary approaches and the performance of systematic managers has been better over the long run. Systematic and discretionary trading performance is usually not highly correlated. Systematic trading which is often trend-following is an effective balance between system 1 and system 2 decision-making. From Kahneman, we know that system 1 is associated with fast thinking and decision-making while system 2 is slow and deliberate decision-making. When markets are volatile and often move without key fundamental information, there is a premium with acting fast; however, trading from the gut can be perilous. System 2 decision-making is more deliberate and will take more time. Unfortunately, in fast moving markets, this time for deliberate thinking is not available. Fast market conditions need fast decision-making, but fast markets are often complex and hard to understand. You need to use system 2 thinking, but you are forced into fast decisions which will likely lead to mistakes. So how is a balance found between these two approaches? The answer is somewhat easy if you understand how the research process is used to develop models for systematic trading. A CTA, managed futures, can use slow deliberate thinking, system 2, for building models and decision rules. Testing can be conducted and a careful analysis can be used to find the right decision rules. The models, however, are implemented through the use of system 1 thinking. If certain conditions are met, there is an immediate reaction. There is fast thinking. There is a gut emotional reaction which is acted upon through a model. The fast emotional thinking is tempered through deliberate rules. Fast and slow thinking are mixed to provide the proper set of decisions when market events occur. The decision heuristic or rules-of-thumb that are the hallmark of system 1 thinking are developed through the logical analytics that are represented by system 2 thinking. Daniel Kahneman has developed a beautiful simple framework for how people think. We use one of two systems based on speed of processing for making decisions. Looking at this framework can answer a number of questions with how to make better investment decisions and how some managers approach behavioral bias and deal with uncertainty. System 1 is our fast thinking process which is often done unconsciously. It is our quick think process for many easy and routine tasks. It may be more emotion driven and is based on looking for quick links or assessments. This system may jump to quick conclusions, but those may be necessary when we are placed in situations that require a quick response. It is extremely useful for some tasks but also creates problems when undertaking some difficult decisions. 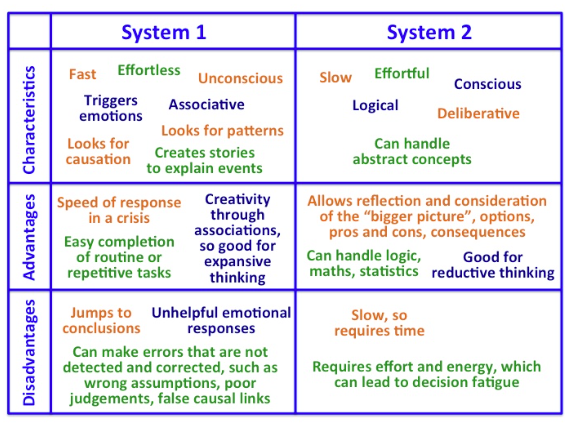 System 2 is our conscious process which is slow, logical, and deliberate. This type of thinking is not useful for simple tasks, but extremely necessary for many of the deeper more complex problem we may face. It is our logical decision center. It is the system we would use for abstract thought. This is not the system of thinking you would use if you have to make a quick decision. It is deliberate and takes time. Good decision-making understands when to use system 1 or system 2. The mixing of systems is the basis for many decision mistakes. 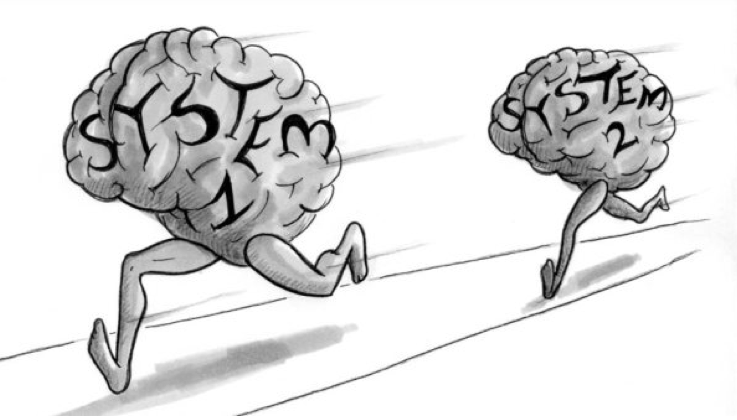 While the Kahneman framework of fast and slow thinking is now employed by many, it has not been used to describe how and why investors would choose an approach for investment management. For example, can the tension between system 1 and system 2 be used to describe why systematic trading models are used by some managers, or how discretionary decisions are made. We think the dichotomy between fast and slow can explain why systematic trading is employed by many managers who are active traders. We can walk through the type of traders that will use system 1 and system 2 thinking. Long-term buy and hold managers who are value traders are likely to be deliberate and careful system 2 thinkers. They are unlikely to be fast reactive traders. Given the thought process of finding good stocks takes time, good discretionary traders will often avoid quick reaction, system 1 thinking. That does not mean that all discretionary traders should avoid active trading, but slow thinking is more consistent with long-term investments and not fast trading. Warren Buffet is an example of a classic system 2 thinker and we know that he will be buying stocks for the long-run. Active traders have to make quick decisions. They use their gut and instincts for trading and would be classic system 1 thinkers. They will also agree that they could be negatively affected by their emotions. Given they are subject to fast decisions that are prone to mistakes, they have to somehow use their system 2 thinking to help avoid problems. The mixing of system 1 and system 2 thinking is the foundation for systematic modeling. The modeler can use deliberate slow system 2 thinking to develop and test models. This can be done in a methodical manner which is consistent with system 2. The implementation of the model can then be employed quickly through system 1 thinking and quick reactions. The fast rules are developed through system 2 thinking which then employ a rapid response when signals are generated. Systematic trading offsets the problems associated with system 1 thinking through careful slow thought in the back-testing laboratory. Some of the best words to hear from a risk manager is "I don't know all of our risks." The key principle from the Black Swam risk management movement is that even if we measure all of the risks from all of the data available there are still risks that may not been measured. Our data may not include events that have not occurred before. Our assumptions of what may go wrong in stress test may not include the truly unexpected. We can know it all, but will still have more to learn about what could have a negative impact on a portfolio. These hidden or unknown risks suggest that a precautionary view needs to be used whenever building portfolio. Make sure that any unknown or hidden event will not take down the performance of the portfolio. Over diversification should be avoided, but excessive concentration even when you "know" all of the risks is not prudent. There will always be more to learn and the expense should not come in the form of a debilitating unexpected event. Oil prices have declined by over 35% since the beginning of the year. No one really expected this kind of move and there have not been good explanations for the decline. 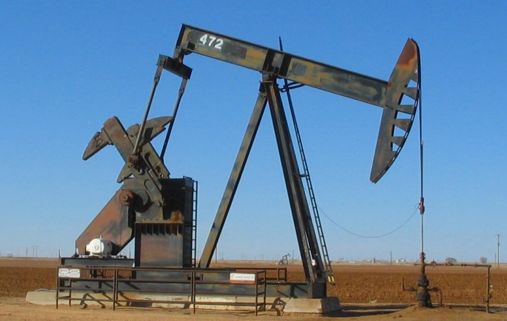 Our understanding of the oil market may be subject to some major rethinking. This type of surprise from our underlying assumptions is a perfect example of a black swan. Forecasters did not have this drop on their radar. The supply story explains the decline only if a small change in production will have a major impact on price. The increase in total global production has been growing at a lower rate than global growth over the last five years even with the impressive increases in US oil shale. There has not been a supply shock in the normal sense. The demand driven story is suspect unless you believe a small decline in demand will cause a massive price adjustment. Global growth has been revised down in 2014, but the numbers do not suggest a recession. Most of the oil demand increase has come from emerging markets. These economies have slowed but are still growing at much higher rates than the G10 and represent a greater portion of overall demand. Regardless of the cause, this oil decline has all of the hallmarks of a black swan. However, investors need to appreciate that all black swans are not bad. For consumers this price decline has become a windfall gain. For oil importing countries, it will improve trade balances. For exporters, the impact is very negative with a significant change in the terms of trade and a reduction in balance of trade surpluses. This decline is a major negative credit event. Companies will fail. Investments and loans will go bad. Credit risk has increased. None of this was expected. Black swans will always lead to winner and losers. Investor have to look beyond a one-sided view of market events.